AFL Oceania Development Manager Andrew Cadzow has confirmed the identities of the four young players selected for the November AIS-AFL Camp, as discussed in Oceania young talent to be tested at AIS. 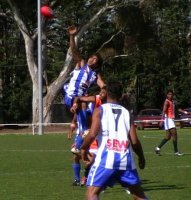 The players were the two previously reported, 16 year old Liam Ackland from New Zealand and 17 year old Tienan Carbry from Papua New Guinea (both representatives of their countries at the 2008 International Cup) and the two Fijians International Scholarship Listed by the Western Bulldogs recently. Cadzow also alludes to plans in 2009 for a Junior Oceania Cup. The four players are not the first to have been exposed to this program, as previously reported by worldfootynews.com, with talent from PNG, Japan, Great Britain and NZ previously tested. As Cadzow explained, "The AFL’s strong, progressive and innovative talent program headed by Kevin Sheehan, Alan McConnell, and the AFL Talented Player Pathway staff have continued to present opportunities for International boys to attend the annual November AIS Academy camp as one part of the Academy program". "This is one of the now numerous opportunities becoming available for our International boys - including the AFL Talent Pathway, State Titles etc for PNG through Queensland, the International Scholarship scheme, the 2009 Junior Oceania Cup and the expanding Scholarship schemes through individual countries to place boys into the football system". In the end, up against visa and passport requirements, it was decided that the Fijians would miss the camp and instead go to Australia for a similar experience in January 2009. Cadzow described Solomon Loki as a 16 year old athletic key position player and 19 year old Inoke Ratu as exciting and whose size, athleticism and testing is very similar to Nick Naitanui, the Fijian-Australian who was drafted to the West Coast Eagles with the second pick overall in Saturday's NAB AFL Draft. Cadzow said "Western Bulldogs development manager Simon Dalrymple has programmed a January time frame based out of their Melbourne base to give both boys the opportunity missed now. Both boys are in training with a skills, running and weights programs and special emphasis on diet and game knowledge". Liam Ackland was described as a 16 year old New Zealander who is based in Auckland and comes with strong credentials, is an elusive midfielder and strong all-round sports person. Tienan Carbry, 17, has been fast tracked through the AFLQ Rookie Search program after being a late addition strong tall asset at the International Cup for the triumphant PNG Mosquitoes after only a handful of games. He tested "close to elite level". Interestingly all four boys have been discovered through different avenues, with the Bulldogs holding a talent search program in Fiji, Liam Ackland through the NZ talent program and Tienan Carbry through school football, AFLQ Rookie Search and the International Cup. Just on Liam Ackland. His father - it's been reported is John Ackland - who coached the Samoa RL side at the recent RLWC. (and also assistant coaches at the Warriors). illustrates his advocacy for RL in Samoa and Tonga in particular. And his reputation as being a 'visionary'. Interesting that his son has 'flown the coop'. But, also, that Ackland senior, via his son, would have a greater appreciation for Aust Footy in the Pacific Islands region. Thanks, yes, a mistake. Corrected now. Had it right in the previous article, must've switched the names in my head - if only there was an editor to edit the editor!